Announcing our WINNER and Top 3 for April! It is the last day of the month and time to announce our TOP 3 for the month of April, and the randomly drawn WINNER of our monthly prize. What an awesome assortment of entries our DT had to look through this month, 53 in total! One of you will be contacted by our Admin Team and asked to Guest Design in June! Don't forget to grab your TOP 3 blinkie to place on your blog! 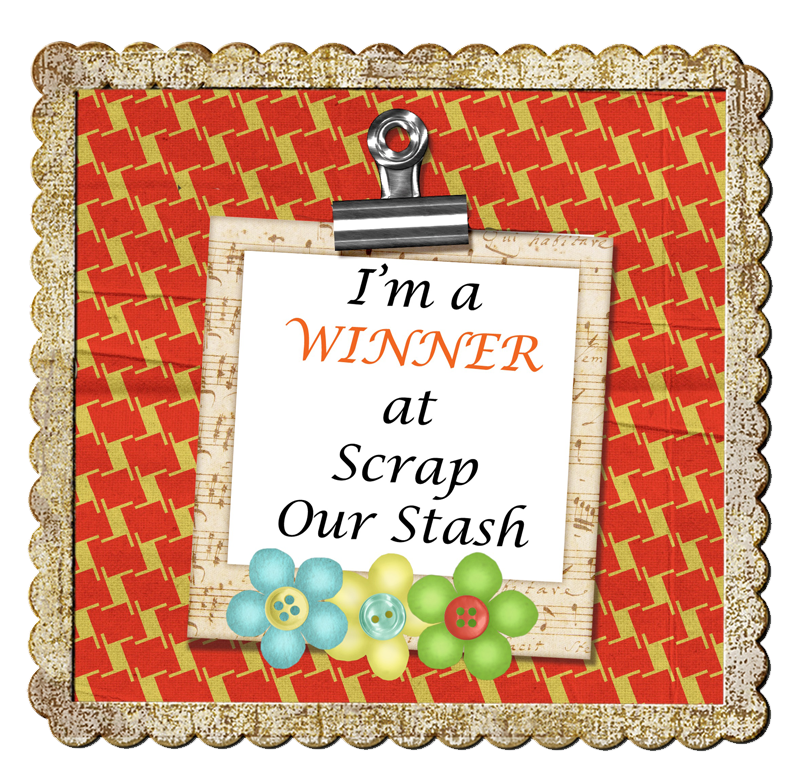 To claim your prize please comment below and then email us at scrapourstash@gmail.com with your mailing address. Please put April Winner in the subject line. 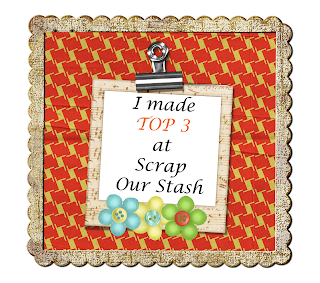 Stop in tomorrow for our new Stash Challenge and to meet our May Guest Designer!!! Last Day To Link Up April Entries!!!! Make sure you stop by our blog tomorrow to see which April entries were selected as the DT Favorites this month and our monthly prize winner!!!! Our first Guest Designer since we changed over to the new challenge format will be revealed along with our May 1st Stash Challenge. Please come by our blog on Wednesday to meet her! The challenge will be posted on May 4th at 6:00 AM (EST) and you will have until Sunday, May 5th 11:59 PM (PST) to link up your entries!!!! We will be giving away (2) prizes!!!!! "I had a little trouble with the circle on this one. I used the outside of a bowl to place the buttons but next time I will draw a line with pencil and then place the buttons. Because of the different sizes, they didn't line up as nice as I wanted them to. This is a very different layout for me because of the colors but they worked well with the photos and I've almost used up this paper packet now." This is it for the April design team reveals but you have until tomorrow night 11:59 PM (EST) to get your entry in for our Sketch Challenge as well as our Polka Dots & Strips Challenge!!! Reminder: Winners of the monthly prize are randomly selected and posted on the last day of the month along with the DT TOP 3 picks!!!! Have a wonderful week and thanks for stopping by!!! Just a couple more days before our April Sketch Challenge ends! 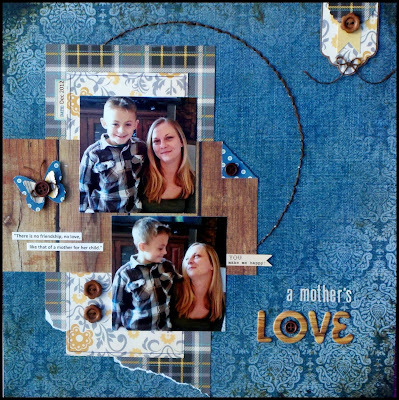 Rochelle's awesome layout and interpretation of the sketch is sure to inspire you to get your scrap on! "For this challenge, I used one photo instead of two. I had stitched the circle. 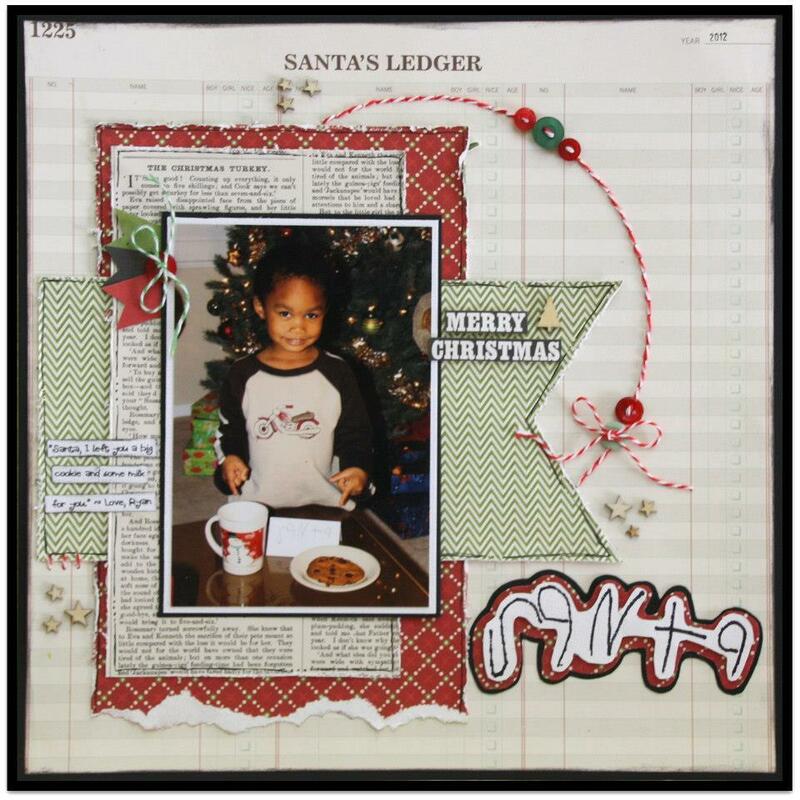 I am bummed that you can't see the note in the photo, but the title "Santa'" is exact note that my 4 yr old son left for Santa To use up my stash, I added buttons around my page." The details for the April Sketch Challenge can be found HERE! We would love to see you get your sketch on, dig into your stash of buttons and create a layout to enter to win this month's prize! 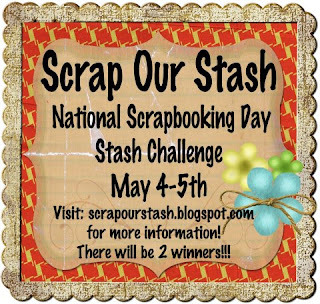 Celebrate National Scrapbooking Day With Us!!! 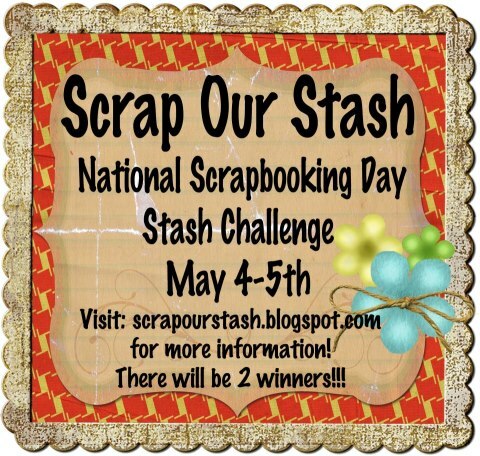 We will be hosting a "STASH" challenge with the chance to win not one but TWO prizes!!!! for each challenge you complete you earn an entry into our monthly prize drawing!! Our first Guest Designer under our new challenge format will be featured on May 1!!! Please stop by our blog on the 1st and join us in welcoming her! Our TOP 3 Favs and monthly prize winners are posted on the last day of each month. If you are a winner you have until the 15th of the following month to claim your prize. 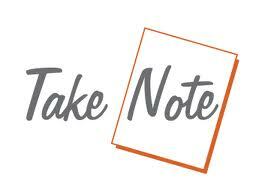 If we have an unclaimed prize, we will have another random draw to select another winner and that winner will be posted at the end of the month with the winner of the current month. Make sure you visit us tomorrow for more DT inspiration using our April Sketch! Sharing another SOS Designer interpretation of our April Sketch Challenge! 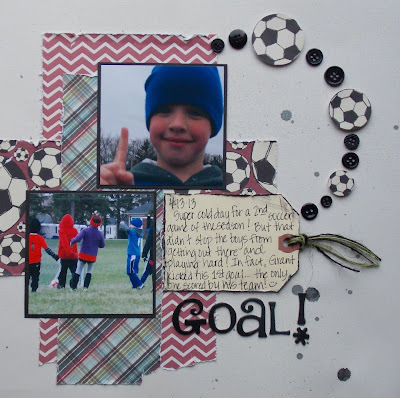 Wendy used the sketch to create an awesome sport page! Doesn't her use of the buttons and basketball embellies inspire you to get to your scrap area, dig into your stash and get to creating? "What a great sketch to work with! I created my circle element by using a black marker and making little dashes...then adding "just a few" buttons. The orange piece is real textured paper! It feels almost like a real basketball. So fun to use up the stash." Click HERE for the sketch and challenge details!!! "I pretty much stuck to the sketch as is. 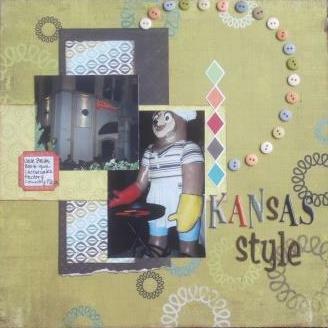 I used So Sofia pattern papers from my minds eye to compliment the Kansas Style restaurant pics. I inked the edges to give an antique look. I placed the buttons to try and make the circle in the sketch stand out. Great sketch Brenda! Pretty true to form, quick easy and lots of fun!" You still have a few days to work on your layout and link it up for a chance to be entered into our monthly prize drawing! 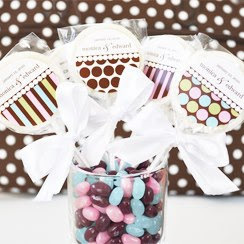 You also have time to complete our Polka Dots & Stripes Challenge. Each challenge completed will give you an entry into the monthly prize drawing. 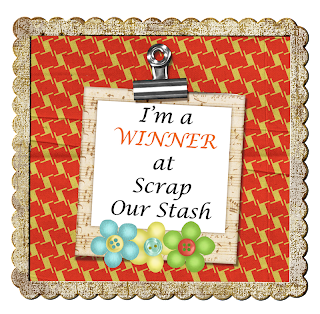 Hello and welcome back to Scrap Our Stash! "I like working with sketches; it makes me try new compositions and ways of putting my scraps together! Here I used some pictures from Holland at my mother's house, where I have spent many summers. Not many decorations but a circle of buttons to get it more colorful! We hope that you have been inspired to play along. You still have until April 29th to upload your entry for our April Sketch Challenge! Make sure you come back tomorrow for another DT example of this month's sketch! SOS Designer Lindsey used this month's sketch to document these photos of her children and their cousins. 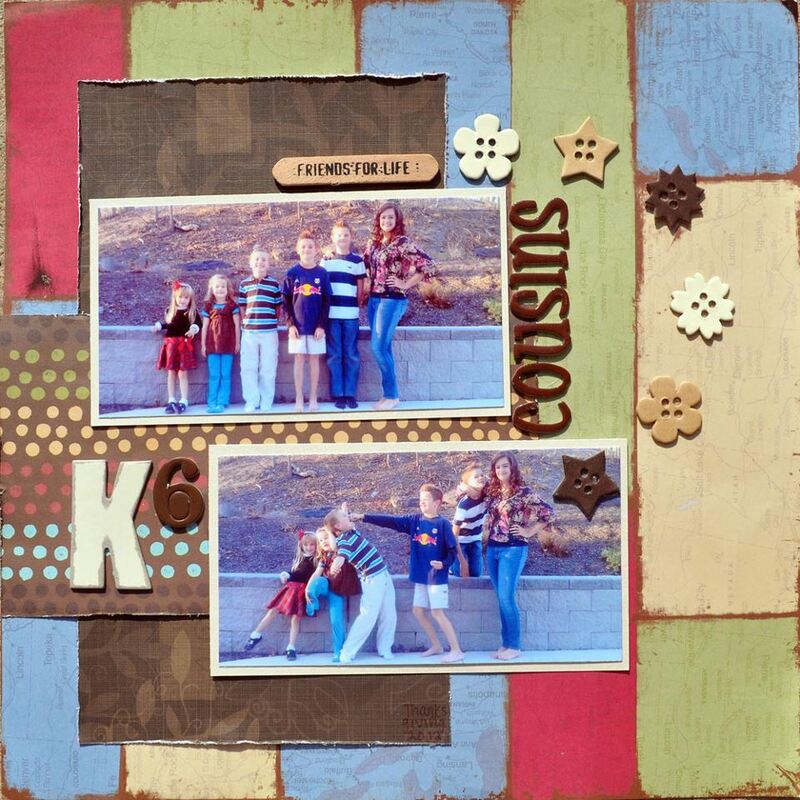 "These are some of our most favorite recent pictures of the Krauss cousins, taken last Thanksgiving. 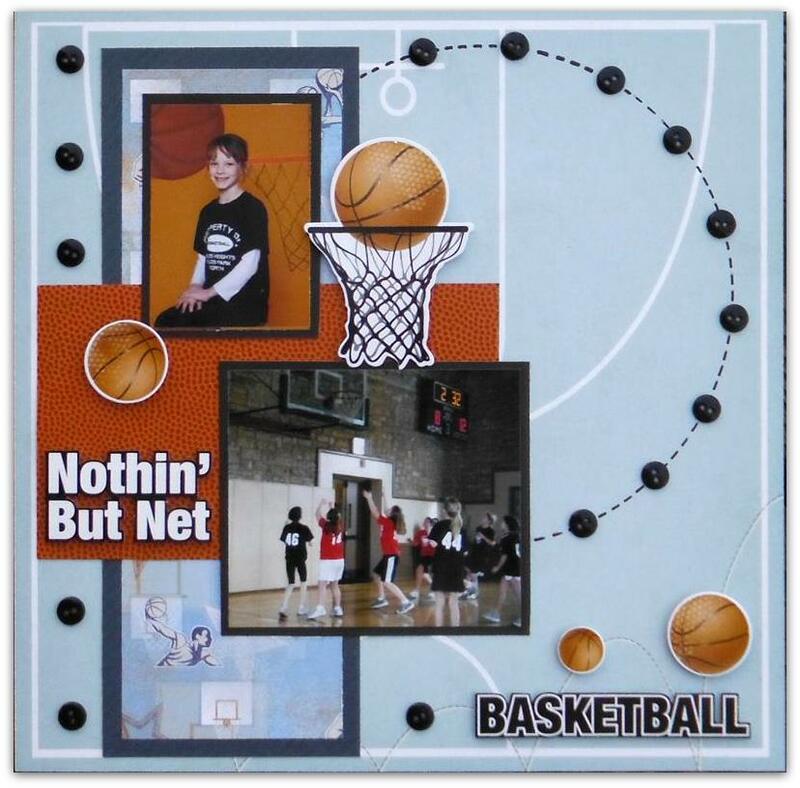 With so many colors and so much action in the photos, this color-blocked paper was an easy background. It just needed a few more touches to personalize it (including 6 chipboard buttons) and voila! No single supply on this layout is newer than three years old!" Click HERE for the sketch! Just posting a little something to remind you about our April challenges and that you still have until April 29th, 11:59 PM to get your entries linked up for a chance to win our prize for the month of April. Create a LAYOUT with at least ONE polka dot paper and ONE striped paper. you must include at least one bird, butterfly and/or bee on your layout! 1. Create a NEW layout using this sketch. You can flip it, turn it, or change the size and number of the photos! 2. You must add at least (6) BUTTONS to your page! Each challenge you completed is an entry into the prize drawing! "Let's Ge Ready To SCRAP!" Just a quick post to share with you today's inspiration! 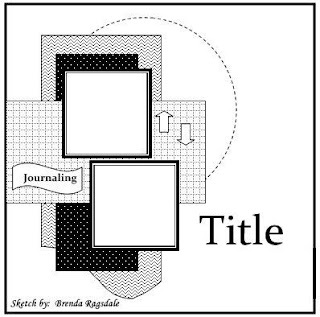 "For this page I used Bazzill In Stitch'z Template to form my crooked circle. Assortment of papers I have been using for this Wedding Album I am creating for my Brother & Sister-In-Law. 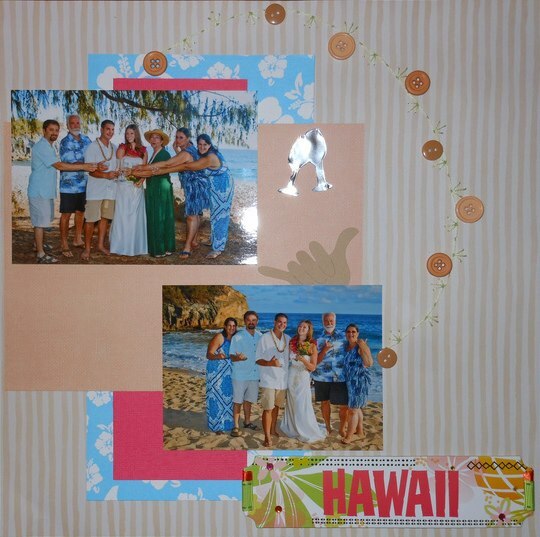 Hang Ten was cut from Life's A Beach Cricut Cartridge and Glasses from Divine Wedding cartridge." Now it's your turn. You are allowed to flip, or rotate the sketch and/or use photos of another size to make this sketch work for you. As long as we can tell you used the sketch, you will be in it to win it! We are happy you stopped by today, please feel free to leave a comment below! I hope you have a fabulous weekend planned and that you will get some scrap time in! "I loved this sketch! 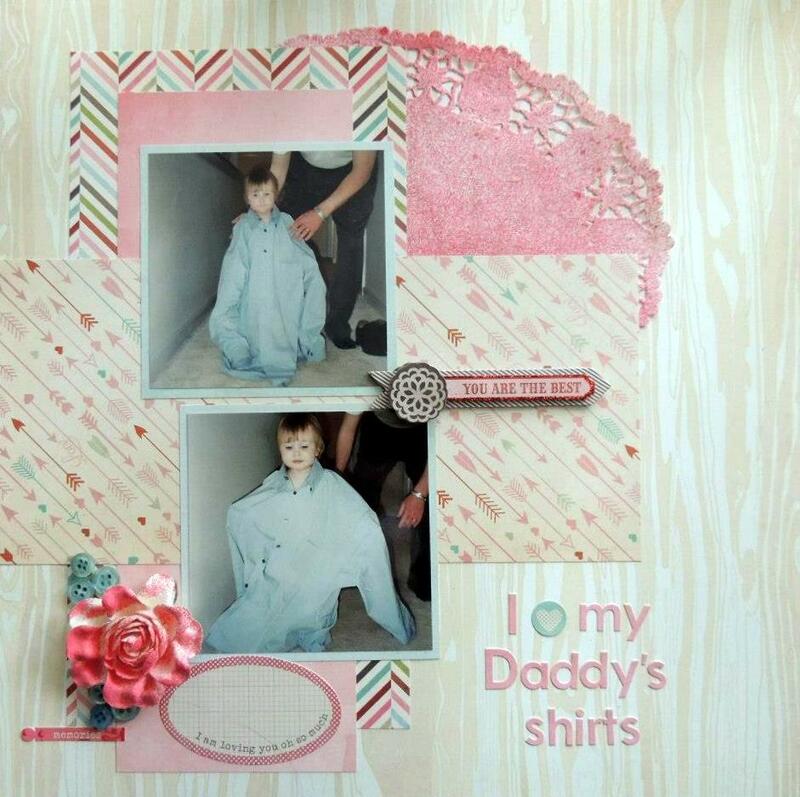 For this layout I used some pictures of my oldest daughter wearing her Daddy's shirt, she loved playing dress up! I misted a doily and a flower to add some color, and my buttons are leaves for my flower (although they are blue instead of green to match my layout.) 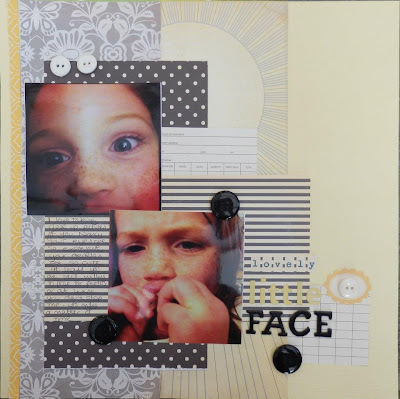 Products I used were Basic Grey (patterned paper, cardstock stickers and alpha), Bazzill cardstock, MME layered sticker and buttons, Heidi Swapp Color Shine, and misc. doily and flower. I just realized I forgot to journal before I took the photo of my layout, oops!" Try the sketch, dig in your stash of buttons and link it up using Mr Linky! We would love to see how you interpret the sketch! Happy Thursday everyone, I hope you are all having a great day! Today DT Karen is sharing her April Sketch Challenge example. I am sure you will find some inspiration if you haven’t started this month’s challenge yet. Feel free to leave some love via the comment section below. "I absolutely love taking close up pictures of my children whenever I get the opportunity. It's getting rarer now and Nancy is the only only that will let me get close enough with a camera. I used a range of yellow and grey papers to go with the pictures. They allowed me to use the paper with the circle already printed which covered the circle on the sketch." For more information and details of our Sketch Challenge, click HERE! 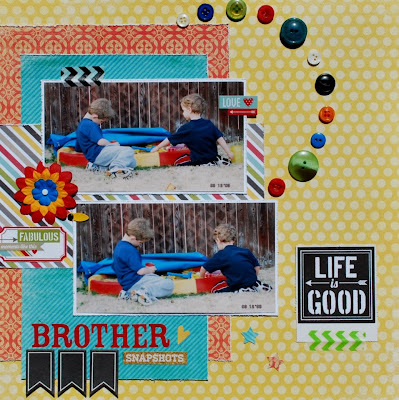 "Brother Snapshots" Layout by Kelly H.
It's a WONDERFUL Wednesday and time to share another design team layout, inspired by this month's sketch! I love the bright and cheerful color combo Kelly used to create her layout, which match perfectly with her adorable photos! "I just loved this sketch when I first saw it and to dig in my stash to find buttons was perfect! I have hundreds if not thousands of buttons and many times I can't really seem to make myself use the large ones so I decided to use those for this fun circle as well as other sizes of colorful buttons. I also dug into my brand new My Mind's Eye Collectible papers and Simple Stories 24/7 for some of the fun subtitles. The Echo Park black chipboard banner finally found a home too. :)"
Thank you for stopping by, and we would love to see your interpretation of this sketch and how you use your stash of buttons! Click HERE for the details on this month's Sketch Challenge. This is what Heather had to say about this sketch and her layout: I absolutely adored this sketch!! I also loved that I could use some scraps from my stash instead of breaking into the new stuff!!! And buttons, oh my yes, I have a boatload of them!! Decided to add the soccer balls (which I punched from the paper and pop dotted) to break up the buttons a little!! Some sprinkles of glimmer mist in the back and my sweet little Grant's rosy cheeks . . . makes it all come together!!! I think I will be using this sketch again!!!! Thanks for stopping by, make sure you stop by each day this week to see our DT members takes on this challenge!!! 2. Dig into your stash of BUTTONS and you must include (6) or more of those buttons on your layout! To create my layout I dug into my stash and found some leftover papers from October Afternoon's "Sassparilla" Collection and stayed pretty true to the design of the layout! I wanted to do something different with the buttons, so as you can see I created a tag and punched a butterfly which I added a button to both. Turned down the corner of one of the pattern papers, added a button and also added one to my title work. There are so many things you can do with buttons on your layouts and I am looking forward to seeing all of the creative ways our members use their buttons as well as this sketch!!! Visit our blog daily to see how our Design Team interpreted this sketch and used their stash of butttons! 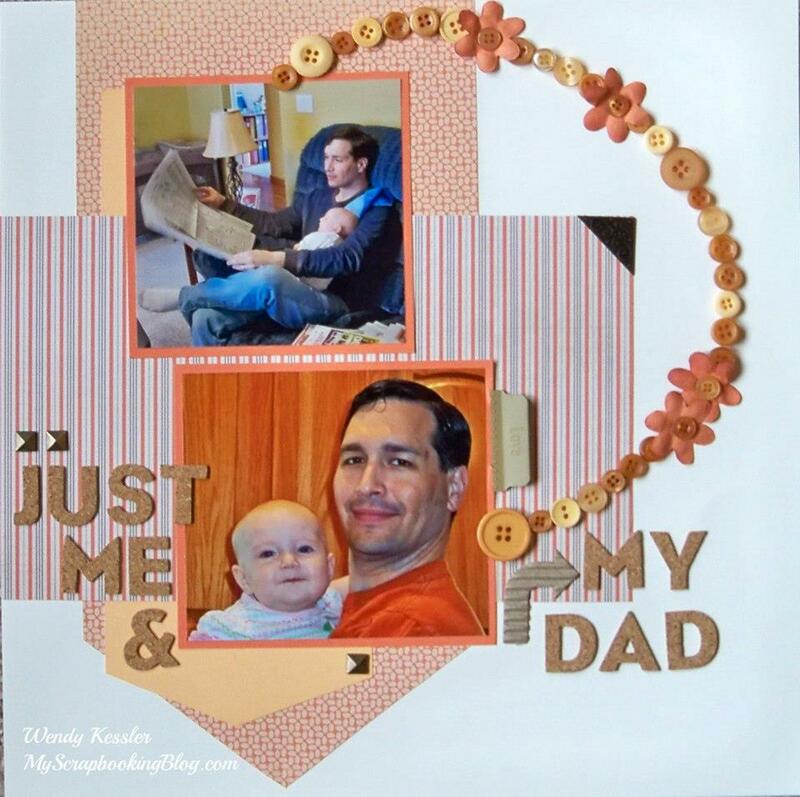 "The Best Uncle Ever" LO by DT Brenda R.
What a great job Brenda did on this layout! The dots and stripes work perfectly! Here's what Brenda said: "There are so many collections that have dots and stripes and I had a hard time deciding on what collection I wanted to use for this challenge. Well, once I found a Becky Fleck sketch it was a draw between FP "The Good Life" and SS "Snap Collection!" 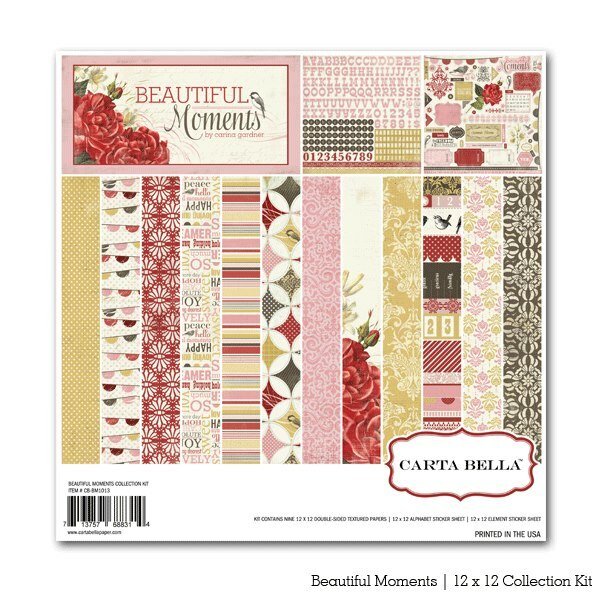 I love both of these collections and the Snap collection has so many options to choose from in the dots and stripe papers. I added the word happy to one of the banner stickers in the collection and layered it with a wood veneer bumblebee by Recollections!" win this month's awesome prize!!! 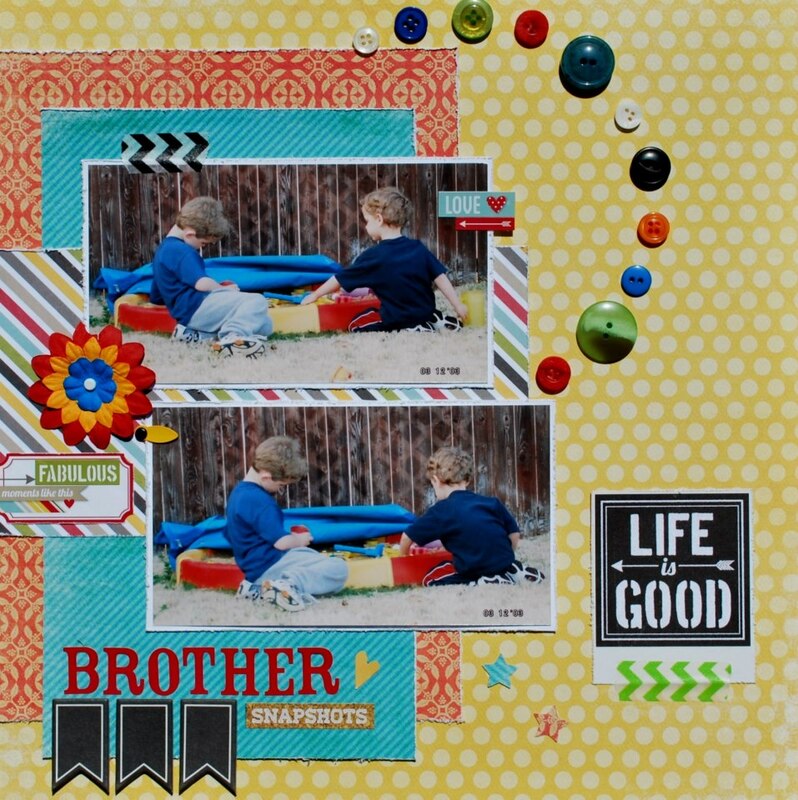 "Play" LO by DT Wendy K.
Take a look at this wonderful fun layout Wendy K. created with Dots and Stripes! I love the contrast between the two patterns! This is how Wendy created her layout: "I started with a sketch and used Echo Park papers and stickers for this quick and fun layout! I just love mixing pattern papers." 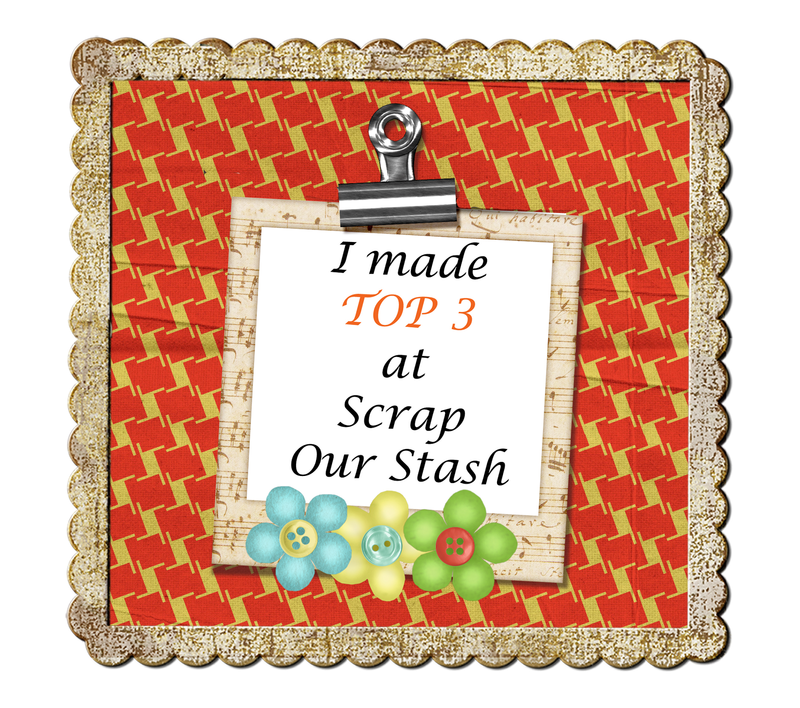 Have you checked out our April Stash Challenge? "Friends" LO by DT Wendy C.
Wendy C.'s says, "Whew! This was kinda tough! Luckily, I had lots of pieces to this K&Company collection. The stripes are the patterned paper, the dots are on 2 different ribbons, and then I added chipboard butterflies, flowers and I even found a bird!" "Joy" LO by DT Tamara R.
Wow! 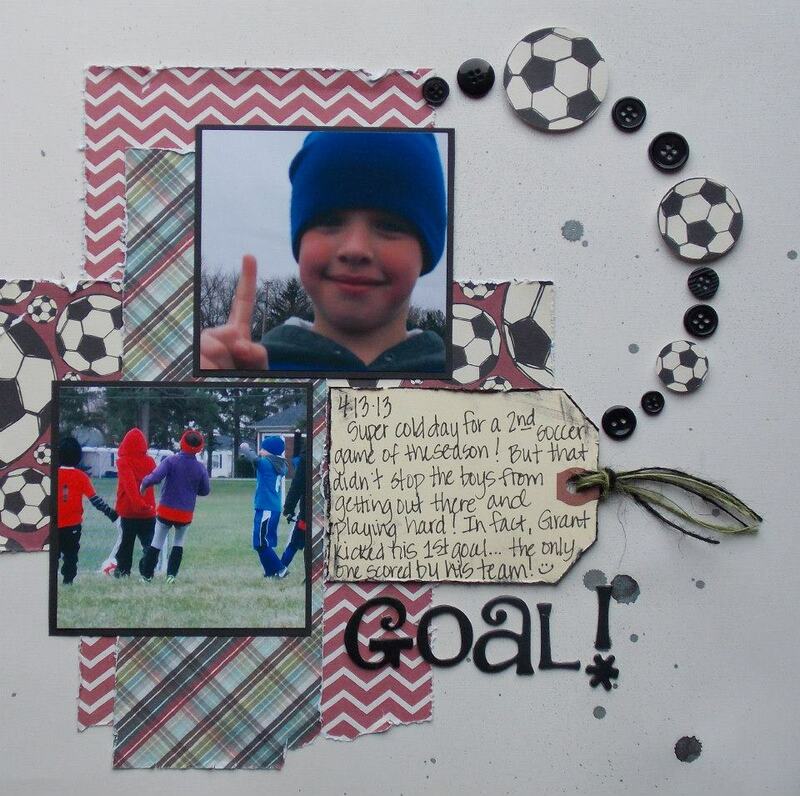 What a fantastic layout Tamara created! She did a wonderful job incorporating the challenge of dots and stripes AND the birds into her layout!! Here's what Tamara said about her layout: "Dots and stripes. I loved this So Sophia paper. It was superb for this challenge, love the velvet green dots. Just a little stripes on the top and bottom. I added birds with my stampin' up! punch. Pics of my trip to Kansas City finish off this layout. Thanks for the challenge!!" "På spåret" LO by DT Charlotta L.
works well for her photos! "One striped and three dotted papers from Echo Park Stripes and Dots collection and also some butterflies from my stash together with some punched ones from the same paper. På spåret means "On the rail", and is about urban gardening on old rails near Stockholm City Center." Don't forget that even though a new challenge will be out on the 15th this month, you still have untill 4/29th to complete this challenge! Check out the details HERE. "EEKS" LO by DT Sarah C.
"One would generally expect something fluffy and cute with this theme, right?... not me! Someone said BIRDS and I went oooo... owls and crows! I had just the right pictures waiting to be scrapped! We are a *major* Geek Family so when I saw an unopened Science Kit at the 2nd hand store that was all about learning brain functions it was a no-brainer (har-har) I snapped it up so my 4 boys could 'experiment' over March Break. We opened it a little early and used the included Jello Mold to make Raspberry Jello Brains for the little 'Welcome Back: The Walking Dead' party we hosted. mmm... Jello Brains! They were a very yummy hit. So happy to see these stickers on a layout at last... they are so pretty and sparkly and pretty and... urm, yeah been hoarding them too long. Sweet Treats is unknown, part of a long paper ribbon with mixed phrases on it. Edged in Stampin' Up! ink. Eeks! in title is traced out with a Silver Sarasa pen by Zebra. Remaining journaling done with a red Sharpie Pen." "Legos" LO by DT Lindsey K.
Lindsey said, "Dots and stripes! I know, for being such a fan of polka dots, I used remarkably very few. And since the pink paper was so lightly striped, I played with striping in the overall design. I also fought tooth and nail to keep bugs and birds out of my stash so long ago, so I had to look long and hard for some! Imagine my surprise, to come across those perfect Crate Paper butterflies after the layout had been laid out and adhered! The rest is just more stash - rub-ons, some punch-outs, even a chipboard button and its holes. The paper and rub-ons clearly didn't come together, but I love the way they go together. More on that and some other hidden treasures on the blog: http://lindseysscraps.blogspot.com/2013/04/creative-thursday-dots-and-stripes-at.html"
"Save the Bees Please" LO by DT Michelle O.
Michelle said, "My daughter in her costume my mom made for her. Used Fiskars Honeycomb texture plate for background cardstock then inked with a stencil brush to add dimension. Spray Mist the B/W Papers with a Pearlescent Light Yellow mix." "It's a Bird" LO by DT Tammy C.
Todays inspiration comes from our DTTammy. "I loved this challenge, probably because I have a large stash of dotted and striped paper--I love those patterns! This is a photo of my son acting like a seagull at the beach, he loved chasing those birds, still does! Everything I used was from the Fancy Pants Beach Bum collection along with a Maya Road bird paper clip, American Crafts Thickers, and Bazzill cardstock." "Cousins" LO by DT Karen W.
Do you love polka dots as much as I do? 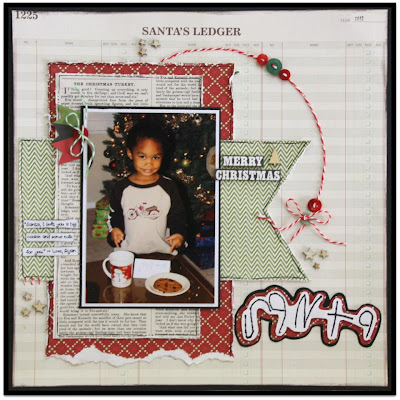 Check out how our DT Karen used different size polka dots on her layout to give a cool frenzy effect! "For My LO I decided to make stripes out of some offcuts of spotty paper. they happened to be in orange, red and yellow so I paired them with some photos of our Christmas trip to see my sister- there are some photos of my son with his cousins. 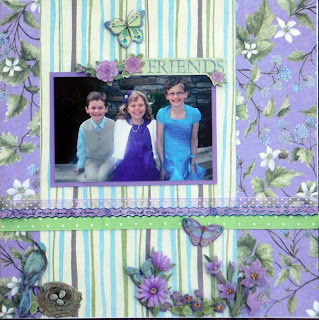 the butterflies and birds were harder but I squeezed in three butterflies and a pice of bird paper"
"Our First Veggie Garden" LO by DT Kelly H.
Kelly says: "I really pulled from my stash this time with photos from 7/99 and some old My Mind's Eye Penny Lane Glitter paper. I also found the adorable bird in my stash and added some twine for the legs and a twine trail for the butterfly. The seed packet sticker and flower are at least over 12 years old! I even pulled out the old label maker for my journaling. :)"
"Inch by Inch" LO by DT Heather G.
"Not only did I use my stash . 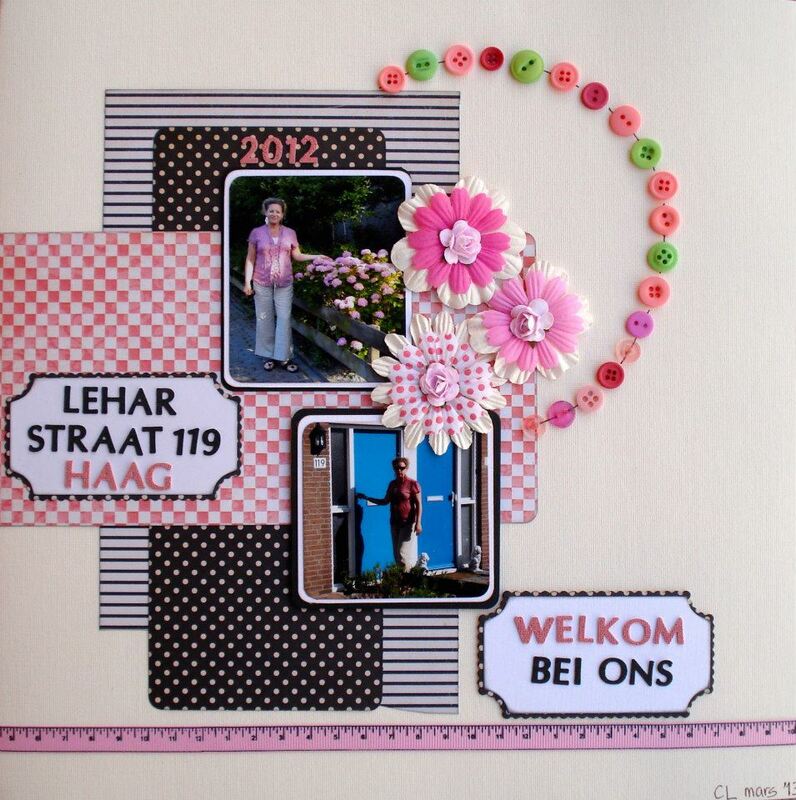 . . but I also used all scraps for this page!!! I did however forget a bird, butterfly or bee so I had to go back and add one to the fence post! lol!!! This is my son and nephew, ages 15 and 12, while we were at Conner Prairie, an interactive historic park on Good Friday. The title is "bigger inch by inch". The journaling says "It's hard to believe how fast these two are growing up. They are turning into young men right before our eyes. There is no stopping them, so we will enjoy the journey moment to moment . . . but they will always be my boys!" Are you ready for Stash Challenge #2!!! I love these photos from the park!! My too babies that are like twins! lol I used Pebbles Family Ties collection because I am so in love with that dots and stripes!! I also pulled from my stash wood birds that have been sitting around still in its package!! Visit our blog daily to see what our DT creates with Dots and Stripes!